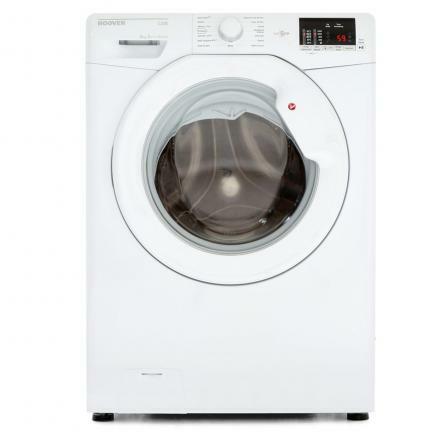 The Hotpoint WMBF742 is an elegant washing machine with great features, great spin speed and great capacity. Everything you need in a washing machine. With a 7kg load capacity you have enough to do the family wash in bulk, it can wash about 35 T-Shirts in a single load. The 1400rpm spin speed will get most of the water out by the end of the cycle to reduce your drying time and costs. It will remove 99.9% of all major allergens by using a combination of high temperature technology an extra rinses. Use the Anti-Stain feature to intelligently managing detergent, water, drum rotations and temperatures in order to remove the most stubborn The Hoover HL1492D3 is a washing machine that gives you huge capacity with a 9kg drum making it great for larger homes. The 9kg capacity gives you more than enough room for your laundry while the 1400rpm spin speed will make sure the water is spun out so the washing is drier at the end of the programme, reducing your drying time and costs. The delay timer also means you can set the washing to be done at a time that best suits you and not the other way around. With the LED display it will allow you to easily monitor all your programmes progress all with a digital display. And with its A+++ energy rating, the washing machine will not only look good, but will mean your energy bills are kept down to a minimum.